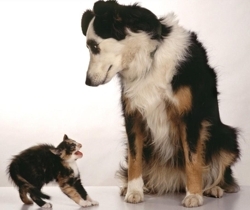 Kittens and puppies are naturally inquisitive, which can often lead to serious injury. Here are some tips on how you can make your house safer for the new arrival. Young animals love to chew when they're teething. Keep electrical wires out of reach, or use a pet-repellent spray. Chocolate can be dangerous. It contains theobromine, a powerful stimulant that is toxic to pets. Sweets, cakes and cookies can also upset a young animal's G.I. tract and lead to diarrhea and, vomiting, which can be serious. Never give turkey, chicken or rib bones as a treat. They can splinter and cause serious injury. Cleaning agents, bleach, ammonia, disinfectants, drain cleaner, oven cleaner, paint, gasoline, rat poison. Keep them locked up. Pets are attracted to the odor and sweet taste of antifreeze. Store it high and tightly sealed, wiping up any spills on the garage floor. Window-washing solution also contains anti-freeze. And remember, engine warmth promotes cat naps, so honk your horn to wake pets under the hood. If you treat your lawn with chemicals, keep pets away. Read and follow label directions carefully. Puppies and kittens grow rapidly. Collars and harnesses can be rapidly outgrown, leading to serious wounds. Cosmetics, shampoos, skin creams, hair "perm" solutions, depilatories, suntan lotions, sleeping pills, antihistamines, aspirin and acetaminophen can all be lethal to pets. Don't leave plastic bags out. Inquisitive young animals, especially kittens, can suffocate. Watch out for hot irons, coffee pots and space heaters. Kittens and puppies will suddenly be able to jump to new heights. Keep covers on hot tubs and swimming pools. Kittens and even young puppies can fall in and not be able to get out. Keep holly, pointsettia, mistletoe and especially Christmas tinsel out of reach. Rule of thumb: if any or all of something will fit in a mouth, it's dangerous. Watch out for cigarette butts, rubber bands, balloons, sewing needles, thread, ribbons and yes, even pantyhose. Because what goes in must come out, often via surgery.